Anyone who participates in the damage polls here knows that Donatella Versace has a thing for perfume. Of course, she's also a businesswoman. The modern Versace fragrance line emphasizes the "business" part more than the "thing for perfume" part, which might explain why so few perfumistas want something Versace. I did think Versense was pretty good, and I still have some fondness for The Dreamer, but the rest of the line is a generic blur to me. Is there a Versace fragrance you love? Do comment. As I wore Eros I thought: “Not great, but not awful. So-so.” But I only had to wait about 15 minutes for Eros’ true character to emerge…and this guy’s not a “hero” but a phony (and cheap to boot). The opening of Eros Pour Femme is just that, so-so. It's sharper than I'd like, and right from the outset smells like more money went into the packaging (and the Lara Stone commercial) than the juice, but it's fine and the pomegranate keeps it reasonably lively. Things go downhill from there; eventually, it's not quite as good as fine. The notes, if you insist, are lemon, bergamot, pomegranate, lemon blossom, jasmine, peony, sandalwood, ambrox, musk and woods, but after 15 minutes it mostly smells like a thin, cheap floral of no particular distinction, and you'd never guess that it costs as much as it does,3 or that three very gifted perfumers — Alberto Morillas, Olivier Cresp and Nathalie Lorson — worked on it. With so much talent at hand, I can only assume Eros Pour Femme is exactly what Versace wanted, or at least, the best they were willing to pay for. Versace Eros Pour Femme is available in 30, 50 and 100 ml Eau de Parfum. 1. Short vs. long idea stolen from Ari at Scents of Self. To her credit, her long review of Chloe Love Story is way shorter than my long review of Eros Pour Femme. 2. Quoted in Out of tragedy at The Guardian, 2/9/2008. As for what exactly Versace stands for, The Guardian pointed out this year that "Among the limp fairytale narratives of haute couture – where, to judge by the dresses, female fulfilment is a matter of embroidery and weddings – the Jackie Collins plot of the Versace empire is compelling." 3. Eros Pour Femme has not yet launched in the US, but Women's Wear Daily estimated the price of the 30 ml size at a little over $80. It is about €57 in Italy. Even if it ends up in TJ Maxx for $19.99, I still say you can do better for your money. Nope, not grabbing me. I think I liked Versense too, but I also think it was discontinued before I ever got my mitts on a mfr sample, so I’m not sure what the point of testing it was. Versense was nice, but it wasn’t brilliant either. Blonde is just before my time…never smelled it, and also have not smelled the more expensive “Gianni Versace Couture” series, maybe those are brilliant. I wore Blonde back in the day (mid-to late 90s). It was wonderful. Blonde piqued my interest because I’d read it was an excellent rendition of Fracas. Never smelled it so can’t say really, but Blonde made me very happy. Too bad it’s been discontinued. I used to wear quite a bit of Versace as well. Looking back to my style in the mid-to-late 90s I’d say it was, erm, colourful. Those were the days. Hi and welcome! Now you’ve made Blonde pique my interest, although I’m pretty happy with original Fracas and I guess I’m too late for Blonde. I have Blonde in eau and parfum, I adore them both! Yes they are HUGE white florals and could give Fracas a run for the money!Not for the faint of heart lol. Worth sniffing. Actually, the Oud Noir is pretty good. Practically a rehashing of the, I believe, discontinued Man from 2003, but a nice one. Sadly, its price tag is a deterrent. I liked Versense too! Thanks! Had to go check the price: $155 for 120 ml. Could be way worse! I find the size nearly as much a deterrent as the price. Love the gorgon head but have not found a Versace scent I like enough to purchase! I like the logo too, but for some reason, not on this bottle. I like the logo too. It would look good in black and white on a clear glass bottle. I was thinking more along the lines of Diptyque. That oud noir bottle is still a little too kitschy for me. BTW, did you spring for that incense soap in the end. I’m stupidly eager to have my reverence for it validated by an official perfume person. If you’re an unofficial perfume person then I must only be a wannabe perfume person (Although sometimes I have my doubts. Those damage polls are like a “turn back now” warning on the side of the road. Ha!) Well, I hope it doesn’t disappoint and if it does, don’t worry. I’ll go on loving it just the same. Jonas, I, too, ordered the soap, and it arrived today! I like the scent very much* and was also pleased to see the natural ingredients and ample size. Glad you recommended it! *Based on how it smells in the wrapper. I have a Claus Porto bar under way so it will be a while before I actually use it. Years ago I read that head was Medusa? Yes, Medusa was a gorgon. Heh. I’ll bite. My guilty pleasure is Bright Crystal. I got a sample as a freebie along with a swap. (Thanks for the pleasant surprise, swapping partner!) It reminds me of the Bath and Body Works Pearberry I had when I was sixteen, and if I layer it with Kiehl’s musk it’s a little bit less silly. Hmmm… I don’t think I’ve ever tried anything from Versace and based on this review, I don’t think I’ll be going out of my way to do so anytime soon. It doesn’t help that their aesthetic doesn’t appeal to me at all. The Dreamer used to be a great oddity, don’t know if it still is…by now has probably been reformulated. Tried this one yesterday. If you like Paco Rabanne Lady Million and especially Chloe Love Story you will certainly like Eros Pour Femme. The fragrance starts off with a rosy white floral accord, quite sophisticated. This flowerness remains just for 30 seconds, then becoming sweet with a typical for Lady Million honey vibe. In fact, Eros Pour Femme is nothing really special or risky, just fruity floral with average+ quality, not as innovative as mens version of Eros. We experienced this one quite differently! Never thought I’d say this about anything, but I’d way rather wear Lady Million. Have not yet tried Love Story. Versace Pour Femme was one of the most Lovely things I smelled in the 2000’s and is a Marvellous White Floral. Crystal Noir is pretty damn good too! I am not sure what to think of Eros… Sometimes the men’s version smells great, sometimes it’s like an Ice Pick in the Temple. I DO want to smell the women’s version, but no rush! I don’t get that much fruit out of it (like I say, I have the parfum which I hear is slightly different), but that image is REALLY FUNNY. I do not get any fruit in it. I do get some violet and civet. I love what I read here! All I saw was Donatella and damage polls….lol. “Not great, but not awful”- that’s how I would describe most Versace scents that I have tried. Crystal Noir was pretty ok..I just don’t do gardenia. I haven’t seen a Versace for 19.99 at TJs unless is was like a mini…but I don’t really check out prices for Versace much. I really don’t like the Pink Diamond or whatever that one is..Yellow Diamond is a bit better..but I didn’t even bother with getting a discounted mini at TJs. I think I would wear it though..maybe:). Maybe I didn’t wear it long enough to notice the pear in YD. I am sure if I got a big pear..it would be over. Also, I don’t like faces on my bottles..they are weird to me. Generic blur..yep..I doubt there is a Versace for me. And I don’t really check TJ Maxx much these days….for all I know, Versace is never there. I loved Blonde in parfum; was better on me than Fracas which I am using as a replacement for Blonde. I used to love to wear The Dreamer on my power suit working days. Better than Fracas! I will have to take your word for it. Better on me, I don’t know about anyone else. Early in my perfumista days, I had what is now called Versace Signature. I remember liking it but not much more because it smelled like a lot of other things that I could have bought. I am a huge Versace fan since my mother starting using using V/E in the late 80’s early 90’s. Blonde was Spectacular and I like Crystal Noir, my favorite men’s is Versace L’Homme. Of course most of them are kind of discontinued now. Hated Eros (such a waste of a name and great bottle) hopefully the Men’s Oud one will be good. Oh, V’e is wonderful! You will find nothing to match its quality, I’m afraid, in the modern line. Another one I missed! Thanks. Versace perfumes are so bland they make me angry. No idea why they do, actually. But they do. It’s crazy that they don’t do fragrances that better match the brand. I think of Versace as “trashy chic”, and a decent trashy chic fragrance isn’t so hard to find. This one is just depressing. I loved the original formulation of Versace L’Homme from 1986. Fantastic stuff. I haven’t smelled recent versions of it. Everything from Versace that I’ve tried over the past decade, which, admittedly, hasn’t been that much, struck me as ugly, cheap, and cynical. Eros for men was particularly disgusting. Although I’m not certain, my sense is that Versace just isn’t the house it once was. A number of their boutiques in Western cities are now gone, and new ones are opening up in second- and third-tier cities in Asia. In our part of the world, I think Versace has lost its cool and the fragrance arm of the business is seen as the best way to keep the cash coming in, even if every shiny bottle of bilge water they produce further dilutes the brand. I mean, I know that the fragrance arm is the cash cow for any house, but it seems like that’s all Versace has going on these days. I read a review somewhere that said that Versace was “over,” as indexed by the fact that you so rarely see it on red carpets these days. 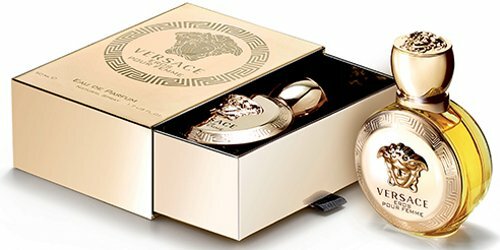 I don’t really know if that’s the case, but I do feel that buying a Versace fragrance these days is like buying a bottle of wine at a truck stop: the bottle may look fancy and cost more than it should, but the contents are little more than industrial-grade shoe polish. The reformulation was well done. It appears a little less “hairy chested” and lighter but none the worse for it. While writing this up I read both stories: that Versace is over, and that they’re completely reinvigorated. Who knows. Agree about the fragrance line, in any case. I have a lovely Versace V’E extrait. The scent is very elegant, and the bottle is da bomb. Aside from that one bottle, I’ve never felt compelled to explore the Versace line. Have to confess that Donatella kind of freaks me out, a little. She’s looking a little scary, admittedly. Aging gracefully is a challenge. Definitely have a fondness for Versace L’Homme. The green juice from the 80’s. It’s a little loud but I love it on a cool night. An old friend of mine, sadly no longer with us, wore the original Gianni Versace fragrance – was it just called ‘Gianni Versace’? She hugged my husband goodbye on one occasion & for weeks afterward his motorcycle helmet smelled of her perfume – he loved it! I don’t think it’s been available for years, but equally, for years when I did catch a whiff of it, I thought of her.